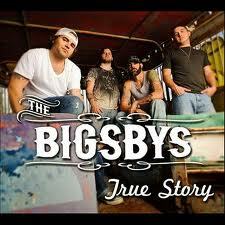 True Story, the new album from The Bigsbys consists of stories that are all a little bit true. The Bigsbys are a hard group to fit into a genre, but easy to appreciate. Soul permeates the sound of the band. The Bigsbys music is a merging of Roots Rock, Alt Country, Blues and Soul. The band is comprised of four guys from Palestine, Texas. Alex Smith(Guitar/Lead Vocals) has been writing songs for the better part of a decade, and over the last few years has built a foundation for his words to be heard. Brad Hobson(Lead Guitar/Vocals) brings a bluesy/Indie Rock style to the group that gives the tunes a sound like no other. Russell McClendon(Bass) keeps the vibe funky and fresh from start to finish on every song, and at every show. Joey Tritico(Drums) certainly helps prepetuate the myth Rock N Roll belongs in Texas. The bands sound is unique, and their ability to play to any crowd seperates them from the pack of bands touring Texas. In an apparent attempt to hide any signs of his former career, Jeff Strahan wears his hair so big it makes Lyle Lovett’s former hairdo look like a crew cut. Not that Jeff is ashamed of being a lawyer, but that was his old life. Now he makes music full time, playing all over Texas, with frequent tours to other parts of the United States, combining his stage training from law school with his natural ability to connect with the audience. Throw in a thirst for writing songs that he can play in front of people, a spirituality that has guided him his whole life, and the intelligence to make it all come together, and you’ve got an Americana act that translates around the globe. Industry Reviews of You’re Country Now “…Outstanding vocals…Inimitable Style.” – Lucky Boyd Co-Founder of My Texas Music “You’re Country Now” is a terrific album from the talented Jessica Shepherd…This album is for all Country music fans that enjoy a fresh and innovating classical approach to the genre and features a talented female vocalist…” – Radio Indy.